Ellicott City's first official cleanup day on Sunday was interrupted again by rain. Owners and residents are now unsure if they'll reopen and stay on Main Street, after two floods effectively wiped out their businesses and homes in two years. Ellicott City, Md. — One week after the Ellicott City flooding, the city’s cleanup progress is being hampered by rain that just won’t go away. Earlier on the city’s first official cleanup day Sunday, officials announced they were scaling back access to Main Street due to rain being in the forecast. Anyone granted access was asked to keep volunteers down to 10 people maximum. 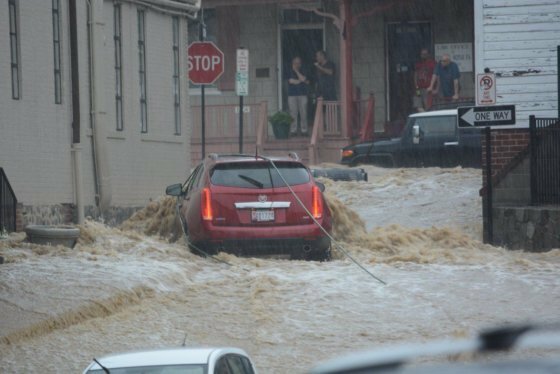 Last Sunday floodwaters swallowed up Main Street, leaving behind a wave of destruction and one person dead, just two years after a similar flooding in the historic city. Very preliminary damage estimates for the recent Main Street flooding are at $10 million — which would be reserved just for infrastructure and not businesses, said Mark Miller, a Howard County spokesman. Main Street residents and business owners were supposed to have the entire day Sunday in the restricted damage areas to begin the cleanup process but rainstorms cut the day short. “We’re doing everything we can to give the people as much time as we can allow them down on Main Street, but we have to ensure their safety first,” said Miller. He said they were not concerned about flash flooding with Sunday’s storms, but they were concerned about lightening and about possible areal flooding. The rainstorms kept business owners like Kay and Jon Sandler, who own a title company called Lawyers Advantage Title Group, from getting back on their feet. Kay Sandler said their future in unknown at this point. She said before this latest flood everything was nice again and the businesses owners were doing well after rebuilding from the July 2016 floods. “It’s really sad and the street really had just really come back,” she said. Rob Denzer helped with the clean up on Sunday. He was in his third floor apartment on Main Street when the flood hit. “I couldn’t believe it was happening again. Nothing was going to stop it,” Denzer said. Although he did not lose anything in the flood, it is still emotional since this is such a close community. “The whole lower Main Street is like one big family,” Denzer said. Denzer has only lived on Main Street for three years, but he has been through both floods. He is leaving Main Street since he is getting married in July and moving into a house. He knows some of the business owners will not be rebuilding and said he doesn’t fault them for that. “It’s hard after losing everything the first time and expecting it to never happen again, it’s unimaginable,” he said. The owner of Bean Hollow, a coffee shop on Main Street, posted on Facebook that the store will not be rebuilding again on Main Street. “I’d never forgive myself if anything happened to one of my staff as a result of a flood,” Owner Gretchen Shuey said. Ever since the 2016 flood, Shuey has lived in constant fear and anxiety triggered by every rainfall and every radar image of a storm, she said. 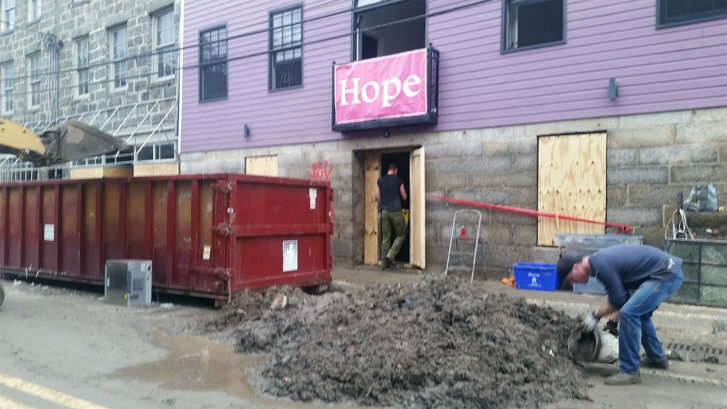 Several of her young employees were trapped in the coffee shop by the floodwaters in 2016. They all made it out safely, but she said will never get over that. “The Bean Hollow 911 call from the flood of 2016 was described by the 911 operator as the worst of all the calls she took that night,” she said. Bean Hollow might open up at a location in Catonsville.